These ice cream cone cupcakes make a fun birthday party treat for kids. You bake cupcakes right in the ice cream cones. Fun, huh? This recipe is really simple, and it includes some special tricks to make sure your ice cream cone cupcakes turn out perfectly baked every time. Prepare cake mix batter according to package directions. Set aside. Cover a standard muffin tin with aluminum foil. Using a skewer, prick holes in the foil where the muffin cups are. The holes don't have to be perfectly in the center of the muffin cups. You're just going to use this set-up to keep the ice cream cone cupcakes stable as they're baking. With your fingers, widen holes slightly, and place 1 ice cream cone in the center of each muffin cup, flat-bottomed side down. Fill each ice cream cone with about 2 Tbsp. of batter. The batter should come to the lower inner rim of the ice cream cones. Do not fill all the way to the top, or the ice cream cones will topple. When ice cream cones are filled with batter, pick up the whole muffin tin pan and gently tap it on the counter. This helps the batter settle down a bit. If some of the ice cream cones aren't filled to the lower inner rim at this point, add a little batter so they all come up to that point. Bake ice cream cone cupcakes 20-30 minutes. Check at 20 minutes. When a knife inserted in the center of the ice cream cone cupcakes comes out clean, they're done. 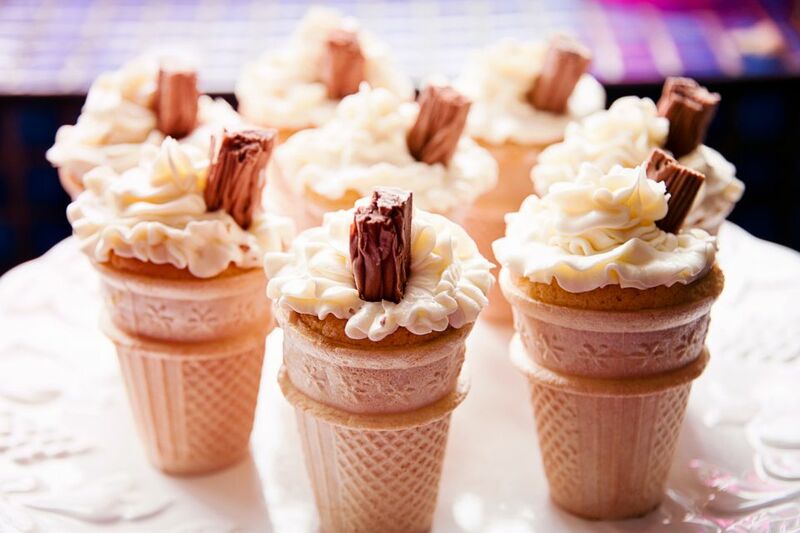 Let ice cream cone cupcakes cool completely. While they're cooling, you can prick the bottom of the ice cream cones with a fork to let some of the steam escape. This will keep the ice cream cones from getting soggy. When the ice cream cone cupcakes are completely cooled and you're ready to serve, spray whipped cream on top in the shape of soft serve ice cream. Garnish with sprinkles.